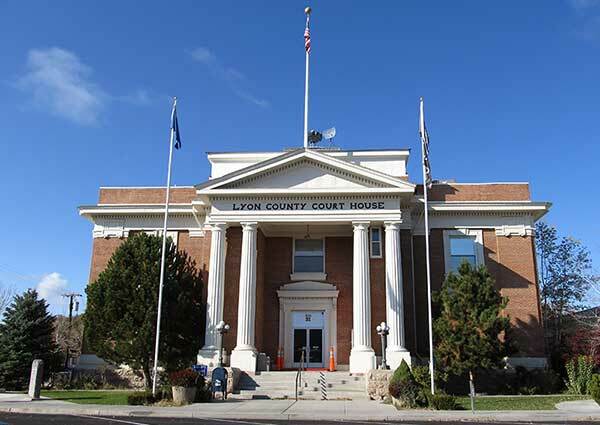 A hearing in the Comstock Residents Association lawsuit against Lyon County and Comstock Mining, Inc., was held Monday, April 23, 2018 in Lyon County’s Third Judicial District Court. At its conclusion, Judge Robert Estes extended the lawsuit’s discovery period for sixty days, with an additional thirty days for attorneys to prepare follow-up briefings. The lawsuit stems from the Lyon County Commissioners’ January 2014 decision to approve CMI’s application for a master plan amendment and zoning change allowing for mining on the company’s property in Silver City. Comstock Residents argue that they were denied due process because two commissioners refused to recuse themselves despite having conflicts of interest arising from their financial dealings with CMI. Specifically, Commissioner Bob Hastings received an inordinately large–$17,500—political contribution from CMI, and Commissioner Vida Keller had a significant, ongoing business arrangement with the mining company. Judge Estes granted a summary judgement against Comstock Residents in 2014, but the Nevada Supreme Court overturned this ruling and ordered the case back to District Court for a full trial. The April 23 hearing was the latest step in the case as directed by the Supreme Court. Judge Estes extended the discovery period to allow Lyon County and the commissioners to produce additional materials required by a separate Supreme Court ruling that communications regarding CMI’s applications made on Commissioners’ personal cell phones and email accounts were part of the public record. Meanwhile, both sides made presentations at the April 23 hearing. These included prior and current briefings, extensive oral arguments, depositions, and exhibits material from Lyon County, CMI, and the Comstock Foundation for History and Culture (CFHC). The Nevada Ethics in Government Act requires public officials to recuse themselves from voting upon any matter in which their own pecuniary interest would affect their independence. The question, of course, is at what point their independence would actually be affected, and how would we know? The law offers some guidance—the standard being how a reasonable person might react under the same circumstances. In other words, would the money they received from CMI, or might receive in the future, affect the decision-making of a reasonable person in the same situation as the Commissioners? In their response, Lyon County and CMI pointed out that Commissioners Hastings and Keller both disclosed their financial dealings with CMI and, in consultation with the Nevada Ethics Commission and the Lyon County District Attorney, decided they were not required to recuse themselves. With respect to Commissioner Hastings, state law does not require disclosure of political contributions and, according to the Nevada Attorney General, campaign contributions do not constitute conflicts of interest requiring recusal from matters involving those contributors. As for Commissioner Keller, the County argued that she was only required to recuse herself if a reasonable person in her position would be affected by the business relationship and—with the burden of proof on Comstock Residents—there was simply nothing in the record to support such a conclusion. The issue with respect to Commissioner Hastings was relatively straightforward because, unlike Commissioner Keller’s case, both sides agreed on the basic facts. Hastings received campaign contributions in 2012 totaling $17,500 from CMI and related companies. These were legal contributions, duly reported by the Hastings campaign. Lyon County and CMI argued nothing in state law required recusal based on campaign contributions, and in any event Comstock Residents have not produced evidence showing the contributions affected Commissioner Hastings’ decision. Comstock Residents’ position was that even legal contributions can rise to the level of a due process violation, especially when they are “overwhelmingly” large. In making this point, Comstock Residents pointed out $17,500 constituted more than sixty percent of cash contributions to the Hastings campaign, and dwarfed any other single contribution. The $17,500 by itself exceeded the total money raised by seven out of ten County Commission candidates from 2008-20014. The Keller situation is more complicated. At the outset of the January 2, 2014 meeting, Commissioner Keller submitted a disclosure statement outlining her financial relationship with CMI. In that disclosure, she stated only that her husband, Scott Keller, was under contract with CMI for one year (2012) as a project manager; that he worked for Priceless Construction on a one-time, CMI-funded building repair; and that he was contracted by the Comstock Foundation for History and Culture to “restore projects” in Storey County. • Commissioner Keller’s disclosure focused only on her husband and his role with CMI, creating the impression that she was essentially uninvolved. She also omitted any mention of how she benefitted from the relationship. In reality, the money paid by CMI went directly to Commissioner Keller through her co-ownership of the companies—represented by Scott Keller—which held the contracts. • The disclosure mentions two contracts, one with Comstock Mining during 2012 and the other, dating to April, 2013, with the Comstock Foundation for History and Culture (CFHC). The second contract paid Scott Keller a $7,083 per month retainer for construction consulting for a term of two years—through April of 2015—though Mr. Keller continued receiving the monthly retainer until September 2015. This included the period of time in which CMI was preparing its application, and the January 2, 2014 Commission meeting. Commissioner Keller’s disclosure clearly states the second contract was with the Comstock Foundation for History and Culture, although the actual contract, which was submitted as a court exhibit, is between Scott Keller of Keller Consulting and Comstock Mining, Inc. It includes no mention of the foundation. This erroneous statement creates the false impression that CFHC was the source of funds for the contract. Lyon County and CMI do admit, in a footnote to their brief, that “the contracts were nominally entered into with CMI prior to the formation of CFHC.” But even after the Foundation was created in July, 2013 the original contract was not modified, and payment to the Kellers continued to be drawn from a CMI bank account. The degree of separation between CMI and the CFHC is debatable, since the Foundation was created and funded by CMI, and CMI’s CEO also serves as Chairman of the Board of Directors of CFHC. In any event, and in contrast to Commissioner Keller’s disclosure, the money paid to the Kellers was always under CMI’s ultimate control. • Commissioner Keller’s disclosure did not include anything about the amount of money involved in her dealings with CMI. This is probably the single most important factor in determining how much influence it might have had on her decision-making. The initial 2012 contract paid the Kellers a $5,000 per month retainer, plus 5% of any construction projects undertaken during the course of the contract. The second, two year contract was for $7,083 per month. Proceeds from the two contracts comprised almost the whole of the Keller household income between 2012 and 2015. Comstock Residents also pointed out these were no-bid contracts, and Mr. Keller was never required to submit time sheets or detailed work records. All in all, and including the several months Scott Keller was paid beyond the 2013 contract, Commissioner Keller received more than $272,000 from CMI during and shortly after the time she was a Lyon County Commissioner. The issue in this case is not so much that Commissioners Hastings and Keller benefited from their relationships with CMI — both sides acknowledge they did. What Judge Estes will ultimately decide is whether these benefits could be seen as materially affecting the “judgement of a reasonable person in the public officer’s position” (NRS 281A.420(3). If nothing else, we might learn just how much money — with respect to our public officials—is too much. Unsurprisingly, there is no “smoking gun” or quid pro quo to be found in the thousands of pages of material produced during discovery, or the depositions. For Lyon County and CMI, this is a telling point. In their view, Comstock Residents have produced no evidence of a due process violation, and the pecuniary interest involved — which were disclosed from the beginning — do not rise to the level of supporting such a claim. Comstock Residents argue that the size and scope of the benefits are, in fact, exactly the point, and that the two Commissioners’ sustained advocacy on behalf of CMI — in the face of the County Planning Department and Planning Commission’s rejection of the application — and their bias toward CMI at the expense of the residents of Silver City, is evidence enough of a due process violation. It is possible that Commissioner Keller’s disclosure statement might turn out to be something of a wild card. It includes, as Comstock Residents tactfully pointed out, a number of inaccuracies and omissions. It nevertheless served as the foundation for much of Lyon County and CMI’s legal arguments, as well as playing a critical role in the Nevada Ethics Commission’s refusal to pursue a complaint lodged against Commissioner Keller. It will be interesting to see how, or if, Judge Estes takes this into consideration. And there is the potential for new evidence. The sixty day extension was the result of another Nevada Supreme Court ruling in favor of Comstock Residents. In the course of their original lawsuit, Comstock Residents had asked Lyon County to provide all communications between the commissioners, county staff, and CMI and their consultants—including communications on personal cell phones and email accounts. The County, with the approval of the District Court, refused, only to be reversed by the Nevada Supreme Court on March 29 of this year. The 60-day extension was necessary to allow Lyon County and the Commissioners to produce these private communications, and for the court to determine which ones might be relevant to the case. Once this additional evidence is submitted, and further briefs filed, the court will make a final decision.